This oral history is taken from a piece compiled by Margot Weller for the Atlanta-based nonprofit Art Papers. Excerpts of previously unpublished interviews appear again here with Knoll’s permission. 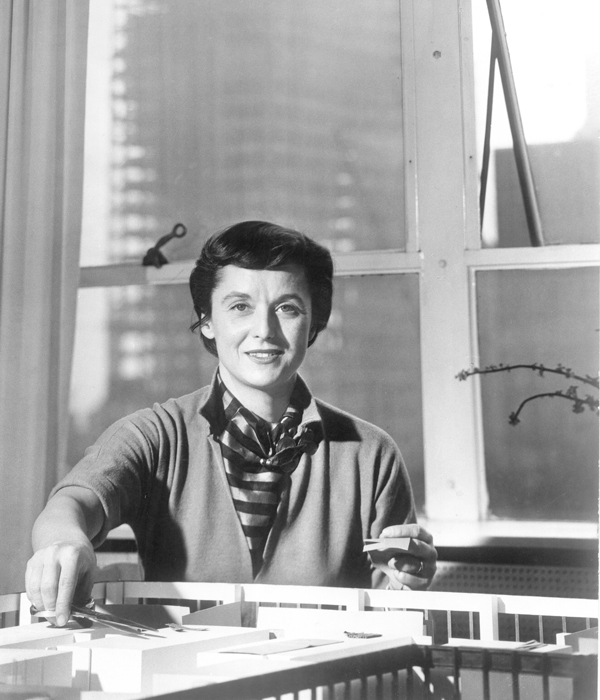 The story of midcentury modernism in America is inconceivable without Knoll, the furnishings and textiles com­pany founded by Hans Knoll in 1938 and joined by Florence Knoll (née Schust, pictured) in 1941. With Knoll’s generous permission, photographs from its archives and unpublished interviews with the designers in the company’s orbit set these figures in dialogue—capturing and complicating the making of a modern legend. 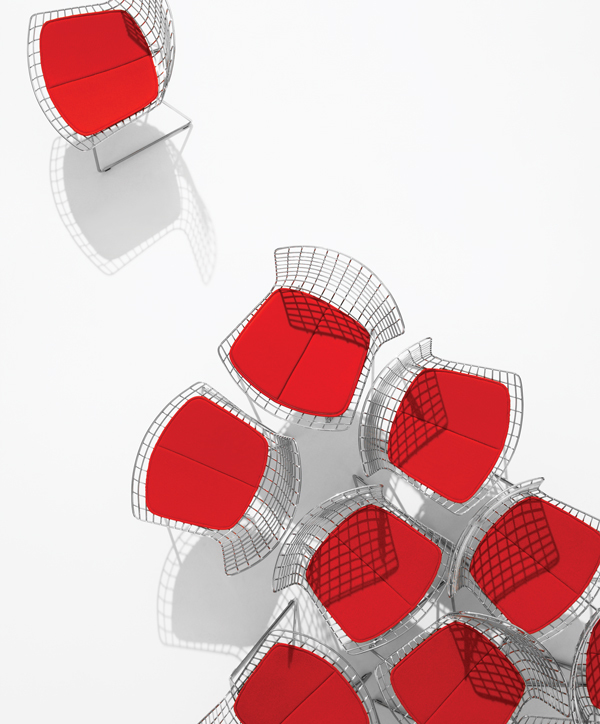 Photograph courtesy of Knoll Inc. Between 1977 and 1979, the architect and later TED founder Richard Saul Wurman, the late graphic designer Massimo Vignelli, and longtime Knoll executive Christine Rae conducted interviews with some 60 figures from Knoll’s first 40 years. They spoke to both major protagonists—such as the company’s founders and chief designers—and executives, clients, and factory operators. The transcripts, originally destined for an A-to-Z compendium, were ultimately excerpted and appear sparingly in the 1981 book Knoll Design, edited by Eric Larrabee and Massimo Vignelli. Gordon Bunschaft American, 1909–1990. An architect at the firm Skidmore, Owings & Merrill (1937–1979), Bunschaft was the principal designer of the Lever House (1952) and would become a champion of International Style architecture in the United States. He received the Pritzker Prize in 1988. Gordon Bunschaft I first met Hans Knoll when he came into our office at 5 East 57th, I think in the winter of 1937. He was just in from Germany and was selling a special flat spring for upholstered seats. I was new and our office had just started. We were interested in furniture for buildings at the World’s Fair in New York in 1938–39. I told him we weren’t interested in springs, we were interested in seats. He was a young fellow, very blond, very enthusiastic, just beginning. Later, 1939 or ’40, I was out in Chicago staying at the Stevens Hotel, and I used to see this lady in the dining room, who . . . turned out to be Shu [Florence] Knoll. I never spoke to her there, but I met her later in New York, about 1941, when she was working for Hans. He had developed a showroom on Madison and she was working there as a designer. American, born 1917. Florence Knoll Bassett (née Schust) helped establish Knoll as a design powerhouse and gave it its comprehensive approach to interiors. Leading the company alongside Hans from 1943 until his untimely death in 1955, and then alone until her retirement in 1965, Florence championed young designers, created the company’s famous Planning Unit as an interiors consultation service, and designed several classic pieces of furniture. Florence Knoll My relationship with the company started during the war with some special interiors for Hans Knoll, who was just starting out in the business here in New York. He had one good chair that he brought over from Germany . . . The design is no longer in existence. I don’t think there are any photographs of it. It’s a shame, because it is still one of the finest chairs. It had a marvelous spring system, which has never quite been equaled. We were never able to produce it in the beginning because the steel that was needed was not available. It was wartime. I was working in an architectural office here in New York . . . having just come from the Illinois Institute of Technology, where I had gotten my architectural education with Mies van der Rohe. I was working in architectural offices here in the city and started moonlighting, in a sense, doing these extra jobs on my own time, for Hans as an interior space planner and designer. Before that, I had been at Cranbrook [Academy of Art]. There were many people there; it was a fantastic group. Charlie Eames was there, Eero [Saarinen] and people like Ed Bacon, who was a fantastic city planner of Philadelphia; Harry Weese, an excellent architect from Chicago; Ben Baldwin, an excellent interior planner. It was a diverse and very interesting group. Harry Bertoia was there. He came as a silversmith. He gradually got involved, as everyone did at Cranbrook, in all forms of design. American, born Italy, 1915–1978. An artist, sculptor, and metalworker, Bertoia studied at Cranbrook before setting up his own metal workshop there in 1939. 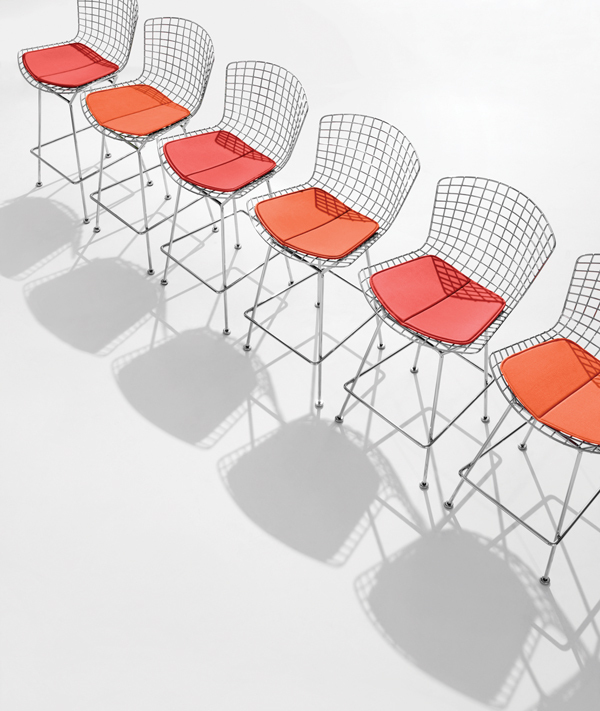 After a brief period working with classmate Charles Eames, Bertoia went on commission for Hans and Florence Knoll, founding a studio in Pennsylvania in 1950 and ultimately creating his iconic collection of wire furniture. Harry Bertoia My first encounter with Shu was at Cranbrook. It occurred at Eliel Saarinen’s home. I was a student, and since the student body was perhaps 35 at that time, naturally you met everyone. My meeting with Shu was kind of marvelous. When I entered the home, she was reclining on a big, beautiful Saarinen sofa. It was a brief encounter. She was a student in, I think, both architecture and design. That was my first contact with what later became Knoll. American, born Germany, 1920–2006. Critic, architect,and editor in chief of Architectural Forum, 1965–1972. As acurator in the newly united Department of Architecture and Design at the Museum of Modern Art (1948–1950), Blakeorganized with Philip Johnson the 1949 presentation of a suburban demonstration home designed by Marcel Breuer, dubbed the House in the Museum Garden. Peter Blake About the beginning of 1943, I came to New York and went to work as a junior writer for Architectural Forum. One day Howard Myers, who was the editor and publisher, told me that he was friendly with a man named Hans Knoll who was making some new furniture out of parachute webbing and whatever wood he could lay his hands on. Howard suggested I go over and meet him. I went to the showroom at 58th and Madison, a funny little building, and met Hans. He showed me the chairs he was making at that time, which, to the best of my knowledge, were designed by Jens Risom. Hans and I hit it off right away. American, 1908–1986. An industrial designer, architect, and prolific writer, Nelson left a legacy visible at all scales—from the Marshmallow Sofa to the pedestrian mall. Nelson served as the associate editor and later co-managing editor of Architectural Forum magazine (1935–1944). He was the first director of design at Herman Miller (1947–1972). George Nelson I first saw [Hans] about 1940 or so. I was working at the top of the old Time & Life Building and we were on a balcony. I remember Hans huffing his way up with a chair of [Jens] Risom’s on his back. I remember a moment when he showed me a check from some [government department] for, I think, $26,000, which in those days looked like the national debt. He didn’t want to cash it, and Xerox was not around then. When I signed up with Herman Miller about 1945 or 1946, I remember Hans coming by, and he was angry at me because I had signed up with Herman Miller. This struck me as odd because he had never invited me to do anything. Florence Knoll Many of the designs that [Hans] had at that time were ones that I did not approve of. I felt they were too romantic and didn’t quite fit in with my ideas. They were Scandinavian. I suggested to him that he try to find other designers to work with him. That’s how the thing started. The Planning Unit existed because of my background in architecture. It was the very first furniture company [that] ever had a planning department. This came from my special interests. Expansion came from Hans . . . who was an empire builder. Peter Blake My first impression of Hans was that he was a very generous, very sweet, very intense man. He never stopped working. He worked night and day. In fact, he had just started living with Shu, and they were working together. Very soon the three of us became close friends. The three of us would go out to dinner, then go to [the jazz nightclub] Cafe Society Uptown. We were together two or three times a week. Hans and Shu had this enormous sheepdog. He appears in the early Herbert Matter ads. He was unbelievable. He slept on the fire escape outside their apartment, on Sutton Place. One of the last things that happened to me at the end of the war in Europe was meeting this Romanian officer wearing an enormous sheepskin coat. I bought it from him, brought it back to America, and gave it to Hans as a gift. He wore that coat while walking that huge dog, and they looked like two dogs walking down the street. American, born Switzerland, 1907–1984. 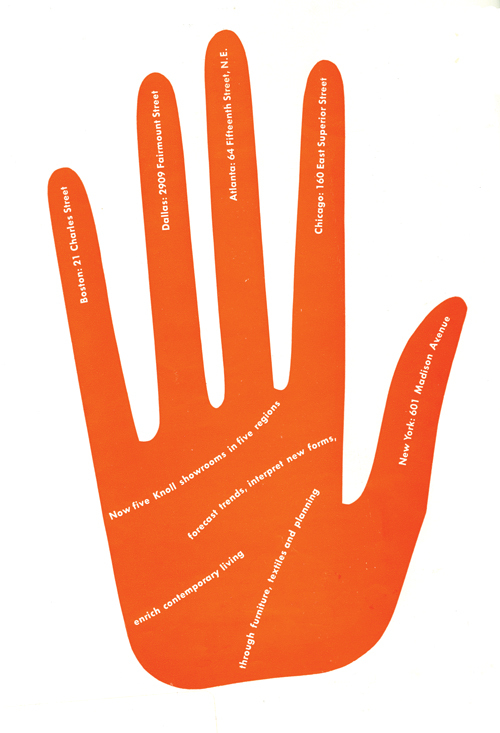 Employed by Condé Nast, Harper’s Bazaar, New Haven Railroad, and the Guggenheim, among others, Matter was at the center of a group of European émigrés who defined the look of graphic design in America, both through his design work and his teaching at Yale University. Matter shaped Knoll’s graphic identity over a span of 20 years, beginning in 1946. Herbert Matter I was in California in 1945. One day Hans wrote a letter and said he would like to see me. Actually, the first few ads were done by Alvin Lustig. I really don’t know how he heard about me. So Hans and Shu came to Santa Monica to see me. As a company, I had never heard of [Knoll] before. When we came back to New York in 1946, I started to work [there] right away. First was the trademark, then some booklets and ads, especially the catalogues. 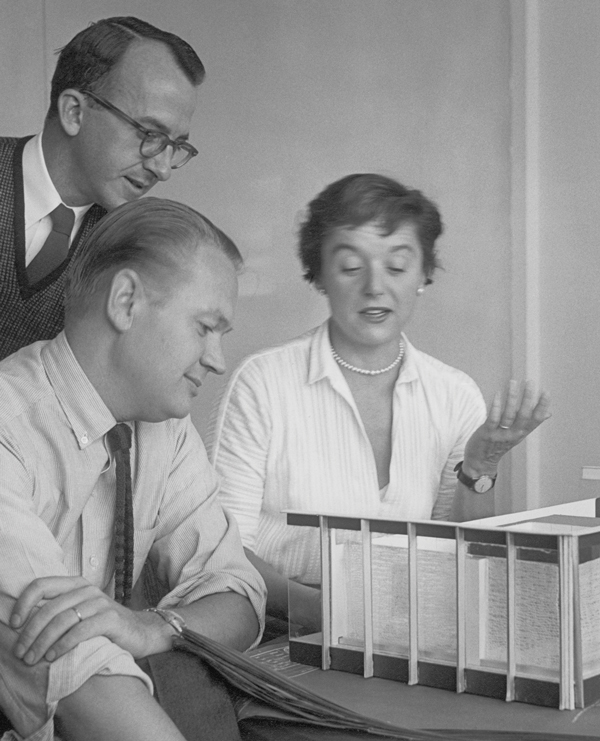 Florence Knoll We had various designers in New York working on our ads—Alvin Lustig, who has since died, and Paul Horan—and I never liked what they did. I was completely dissatisfied. Their work just seemed frivolous or not strong enough. I had seen some of Herbert Matter’s work and decided it was what I wanted. I flew out to California. He was working with Charlie Eames on furniture and graphics. I went out to see him about doing our ads. He said yes, he was very interested. I think it was just the thing he needed; he wanted to come back east. That’s how it all started, and we worked together beautifully. We were doing many, many years ago the thing that is now such great fashion, namely graphics in interiors. The showrooms were done in combination. We designed it together in the sense that we had a wall made of string. He designed the string thing and I designed the structure for it. In the showroom on Madison Avenue, we created a space in the entrance where the big case became a whole wall of design. I consulted him about colors for the showrooms and we worked together. American, born 1926. Schultz participated in and earned mention in one of the Museum of Modern Art’s many Good Design competitions in the 1950s. A crucial member of the Bertoia team at Knoll, he was tapped to develop several outdoor designs to complement the wire-form chairs. His 1966 Leisure Collection of outdoor furniture—initiated at the request of Florence Knoll for her Florida home—is a modern classic. Richard Schultz We used to go over to the Knoll showroom as students and turn the chairs over and look at them. It was an exciting period—1949 or 1950, just after the war, when everything was starting to move. Eero’s Womb Chair—the whole thing was exciting. That whole period in my life was exciting because I had gone in the wrong direction. I had gone two years to engineering school and was very unhappy with that. When I got to the Institute of Design, I really liked it. We were very conscious of being an extension of the Bauhaus. Hebert Matter I was in Basel in a railroad station and suddenly a chimney sweep on his bicycle passed by and made a very strong impression. When I was back here and thinking about an ad, it came to my mind. At that time, Martha Kai worked in the promotion department, so I worked with her. Through her connections, she knew a Shakespearean actor . . . so we chose him to be the chimney sweep and he was wonderful. We used him afterward as a juggler too, the one who juggles three chairs. Hans was really excited when I showed him, and Shu was absolutely against it. She did not think it was dignified. This was not exactly her idea of an ad. The ad was received very well. I think it was probably the most striking ad we did. Florence Knoll We saw Eero Saarinen constantly, of course. He was like my brother, and we talked a lot in those days. One thing led to another [in] the development of the furniture. His first one was in laminated wood because we weren’t able to get other materials. That was a perfectly nice chair, but it wasn’t one of the great successes. I don’t know what it was called. It was the only laminated wood chair he did. Then the advent of fiberglass came along. Eero was working on that approach, but—this all sounds simple now—in those days, it was very, very difficult. We finally found a ship builder in New Jersey and he was working in fiberglass. We got excited about it and Eero developed the Womb Chair. This was at my specific request because I was sick and tired of these chairs that held you in one position. We were just bowled over by it. We were so excited. Eero did this chair and he did this prototype. He used his own office as the research lab in Bloomfield Hills. We’d go out every weekend or as often as we could to watch him. We’d try the seating positions and experiment. I said I wanted a chair that was like a basket full of pillows. Well, it didn’t quite turn out that way, but I wanted something I could curl up in. Eero and I went out to New Jersey to beg this ship builder to make us some models. He was very skeptical. Mr. Winter was his name. We just begged him. I guess we were so young and so enthusiastic that he finally gave in and worked with us. We had lots of problems and failures until they finally got a chair that would work. Courtesy of Knoll Inc.; Ad: Designed by Herbert Matter and courtesy of Knoll Inc.
George Nelson [At Herman Miller] we had been working on chairs and chair bases, and at some point we got to the pedestal base. We had a base, full size, in clay or plaster and were fooling with it. 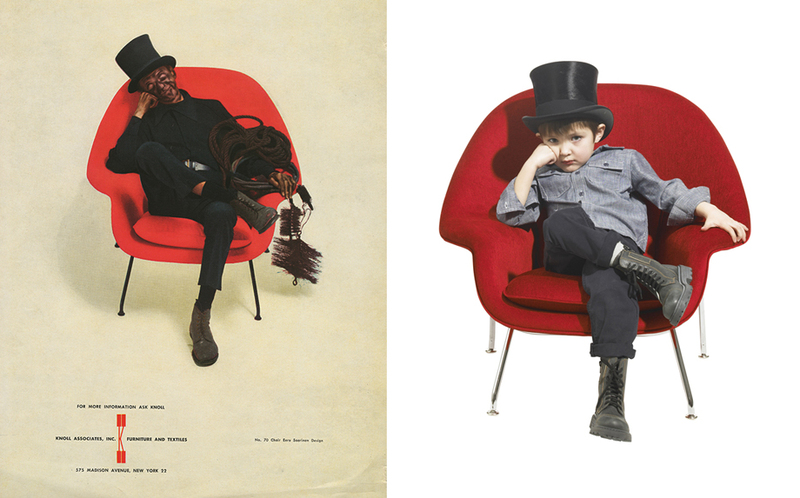 To our dismay, Eero’s first pedestal chair appeared either in a showroom or a magazine. I took a picture of the shop with the pedestal base and sent it to Eero saying, “You won.” A telegram came back saying, “Well, I’ll be darned.” We withdrew it right away because it would have looked like a knockoff. Eero’s pedestal was a hell of a lot more elegant than our pedestal. The real difference between Knoll and Miller, I felt, was the Knoll stuff was really a super-elegant level of taste. This was Shu mostly, maybe Hans. The wire chairs of Charlie’s look good and pretty, but that arm chair of Harry’s with those pointed ends was really exquisitely beautiful. Gordon Bunschaft I don’t know exactly what Mies thought about the importance of furniture, but he had designed these marvelous pieces and, as a result of thewar and other things, nothing had been done with them. The first I heard of it, Hans and Shu invited my wife and I to a Sunday lunch at the Plaza with Mies. It was a marvelous time. He was a very quiet man, and we didn’t really talk about furniture. He likes to talk about marble and was a great lover of marble and onyx. Knoll had the original drawings, and Hans gave me a set because I wanted to make a chair myself. The chair was too big for chroming, so I have the only chair that got as far as nickel plating, but never chromed. The steel chairs Mies originally made are mortised at the corners with flush screws, so I had three made that way. The leather straps I had made by a harness man. This was prior to being put on the market. Knoll in turn developed it and made it in stainless, which I don’t think was done originally. They still make it properly and with great care. American, born Hungary, 1902–1981. Bauhaus student and teacher, architect, and furniture designer Breuer immigrated to the United States in 1937. Several of his furniture designs were procured by the company in 1968 with its acquisition of Italian manufacturer Gavina SpA. Breuer probably first encountered Florence Knoll when she worked under Walter Gropius. Marcel Breuer The naming of furniture is a general principle in industry. The automobiles all have names. Once, when I talked with [designer Dino] Gavina, he said, “We should have a name for this.” This was in the ’60s. I said, “[All right], what kind of name do you suggest?” He said, “You told me once that Wassily Kandinsky was the very first person who saw the first experimental chair.” I said, “That’s true, and he is a good friend of mine.” He said, “Why don’t we call it the Wassily?” Then he said, “You have a daughter, don’t you? What is her name?” I said, “She has an Italian name, Francesca. We called her Cesca.” He said, “Let’s call the other chairs Cesca.” “Then these benches,” he said, “do you have a nickname?” I said, “I use [Marcel] officially, my middle name is Lajkó.” We called the benches Lajkó. He misunderstood the name, and in the catalogues he used something like Lefco. That’s how the chairs got their names. Florence Knoll If you look at Herman Miller’s and Knoll’s work, not now but earlier, they took one approach and we took another. Ours was based on planning, [which] was due to me. I saw the development of furniture in sense of need. Charlie Eames and George Nelson saw it more in the sense of an individual piece. When I say “need,” I mean for a total job. I would say to Eero, for example, “There isn’t a decent office chair, swivel chair, we need one. That’s what we must do.” I felt the need for a nice, big, curling-up chair because there wasn’t one on the market. Charlie designed a chair from the same interest, of course, but they designed more as individual pieces rather than as a cohesive thing for a whole job. George Nelson Recently I heard some gossip that Herman Miller had been asked to interest itself in acquiring Knoll. I think that would be the worst thing that could possibly happen, because the coexistence of Miller and Knoll is what really puts both of them on their toes. We were always designing to each other. We wanted the audience to like what we were saying, but we were really playing to our peer group. It was so strong it was almost as if it didn’t matter if one got a market or not. Nearly a decade before TED, there was Art Papers. This Atlanta-based nonprofit has been exploring cutting-edge issues in art and culture since 1976—both in print and through live forums around the nation. Though best known locally for its festive annual auction (coming February 27 to Bobo Intriguing Objects), the organization goes beyond art to address topics such as natural resources, gender identity, and technology. It has also established a reputation for publishing the early work of provocative thinkers, from French philosopher Jacques Derrida to RuPaul. Characteristically, its bimonthly magazine has pushed the boundaries of print. A 1986 issue edited by Atlanta architect Merrill Elam arrived as a glassine envelope filled with unbound, differently sized leaflets and objects. Robert Wiesenberger, a graphic design critic at the Yale School of Art, edited Art Papers’ January/February 2015 architecture and art issue titled “The Stubbornness of Space.” Margot Weller is an associate strategist at the New York­ design firm 2×4. She has worked as a researcher at Knoll and as a curatorial assistant in the department of Architecture and Design at the Museum of Modern Art.